Transformation | Come believe with me. For all those interested in attending a Bethel Church conference in your area, check out the itinerary. I hope you go to a conference and your life becomes radically more passionate, alive, and whole. Sometimes I feel I’ve been pregnant for 15 years. Other times I am sure of it. The child is a vision, a passion, a calling. The vision is for the Middle East: to thrive, to be at peace, to be madly in love with the Savior. Much of that vision centers on Iraq. In 2001 I had a dream I was in one of Saddam Hussein’s former palaces in Iraq. I was leading a secret church meeting. I knew Saddam’s regime had fallen and he was dead. I knew it was a prophetic picture of a scene which would be fulfilled. In 2003 Saddam’s regime fell. In 2006 he was killed. In 2008 I was told about a man named Canon Andrew White who was leading church meetings in one of Saddam’s former palaces, a mutual friend told him about me. We began emailing. On March 23, 2011 Andrew was in Redding and we had dinner. He invited me to work with him in Baghdad. In 2012 I plan to semi-move to Baghdad to be part of rebuilding and transforming the nation. For preparation and vision-casting, I’m going to visit Baghdad this November. I’ll spend 2 weeks in England and visit FRRME’s home office; then 2 weeks in Baghdad where I will get to know the land, the people at St George’s Church, the folks at FRRME’s medical clinic, the Tigris River. I will also deliver paintings to high-profile leaders in Iraq. To say I am excited would be to say the sun is handy or shoes are helpful for hiking; it is decidedly an understatement. Setting my feet upon Iraq is a moment I’ve burned for, lived for, prayed for with a zeal and a compassion that still electrifies my heart and beckons my soul. Iraq and I are a match made in heaven. For my trip this fall I need $4,000. Today I read 214 pages. An entire book. Just ask the Sacramento River, my reading buddy for most of it. My feet in the river’s heart, my heart warmed via my cold feet in its chilly water. 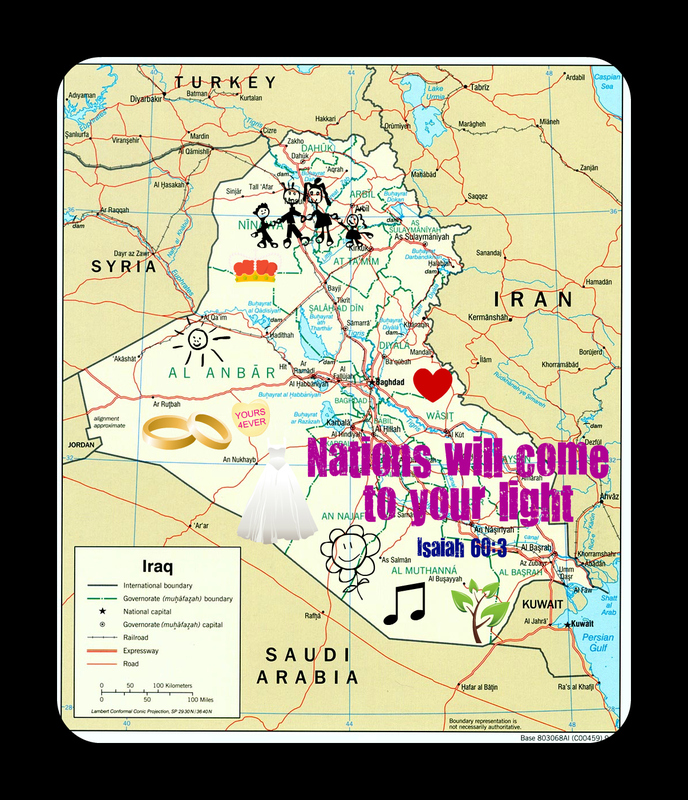 My heart electric with passion for the nations – particularly one nation: Iraq. I’d wanted to read The Reformation Manifesto by Cindy Jacobs for about a year, but over the last few days the want became undefiable. Today I set off to work on my book, the one I am writing, but the metaphorical key was not working in the lock. I could not stop thinking about this other book. I was famished for some vision-casting for nation-building. Thus, I opted to look for The Reformation Manifesto at Barnes & Noble, no avail; next stop: Bethel Church’s bookstore. FOUND. While there I got to jumpstart someone’s car, fun! I love people. And so to all who are called to blaze new trails through thick terrain, take heart. The reason your journey is irresistible is YOU WERE BORN FOR THIS. The world needs you to take your place in history and in the future. You can do it! And with great glory, you will. The world awaits the revealing of the sons and daughters of God. “Cynicism is the language of cowards – always think the worst, you’ll never be disappointed. Jesus is the HOPE of the nations. How can we not have hope when the embodiment of hope lives inside us? Make that new path. Pave that road. Believe change is possible. Believe Jesus. Generations to come will be grateful you did. In the midst of the hubbub about Israel and Palestine, there is a melody – a melody of hope, peace, and purpose. Bethlehem was called by name as a city of promise in Micah 5. Bethlehem is now in the Palestinian Territories, a place I love wholeheartedly – a people beautiful and important. In Isaiah 9 it says the Lord’s government will be ever-increasing. I believe there is a plan for peace in the Middle East. In heaven in a file cabinet, there is a plan. And it is so full of love it would dumbfound even the most compassionate human being. Two years ago I was thinking about all this me-lee, this confusion and unrest. I was living in Bethlehem, surrounded by a thirty-foot concrete wall and checkpoints. And I was declaring Bethlehem’s true identity to be re-established. From those thoughts came the following song, sung on a balcony in the Bethlehem area. He WILL be their peace. Does a watched pot boil? Will a book write itself when you stare at it? My book is coming along. My housemate Kendra had friends staying with us last week and I ended up sharing a story from the book with them. It comes from the year I spent living in a ministry house in Salem, Massachusetts. My friends and I started the house. I lived with six other women, three blocks from a house of six male friends of ours. Our hearts’ eyes looked to see a neighborhood and a city transformed. It was a sensational year. I think most everyone should gather some friends and transform a neighborhood via community and intentionality. It looks different in different seasons, but ultimately it is what we are meant for – whether a ministry house for that express purpose or another venue for city-transformation. Every city in the world should be loved to life and charged with supersonic hope. This weekend I listened to my friend Daniel share about the transformation he is seeing in his neighborhood right now. He smartly got the crime and employment statistics for his neighborhood so he can quantify transformation when he sees it. When the crime rate plummets he will concretely know. I recommend this level of purposefulness to everyone: vision must have clear goals so you can know when you are accomplishing what you set out to do. This empowers strategy AND celebration! We wanted a guest list as varied as the potluck of food. And we got it. Put everything in the largest bowl you have. Stir until your bicep makes your shirt rip. Check half-way through to make sure patience isn’t burning. Plan a stealth water balloon attack by gathering kids in the backyard and then throwing balloons over the fence onto them. Be amazed by their retaliation. Laugh like you have never laughed before. The Egg. Back to the aforementioned egg. One fine day two of the men in the Salem Guys’ House were running on trails in a forest in nearby Wenham, MA. While merrily flowing with the curves and rises in the path, they came upon a man. Camping. (?!) Not exactly camping. A sort of camp was set up, but this looked more like living. And the man looked lost – really, the epitome of lost. He also looked crazed. In classic we-love-people-because-we-are-addicted-to-Jesus fashion, they stopped and struck up a conversation with the man. (Fittingly, Phil had read Hebrews 13:13 earlier that morning, “Let us, then, go to him outside the camp, bearing the disgrace he bore.”) The conversation quickly went from verbal to physical – physical like charades, not like a fight. He didn’t speak English. They invited him to stay with them. Into the car went the man, his chicken-wire backpack, and what appeared to be the totem of his earthly possessions. He fell asleep in the back of Stephen Dunn’s green truck during the short 20 minute ride from the woods to their house. Shortly after his arrival in their home, Stephen Dunn (there were three Stephens in the guys’ house) and Phil provided him with a shower. Since he only had the clothes he was wearing, one of the guys loaned him some clothes to put on after the shower while his own clothes were being washed. After the shower the man emerged from the bathroom with a gift of gratitude for my friend. An egg. One egg. With the highest degree of intentionality and sacrifice, this man designated this gift FOR Stephen. It was the widow’s mite in egg form. Indeed, for this man, the egg was “all he had to live on.” He probably pilfered it from a farm he passed by, hungry and needing sustenance. In giving this egg, his lack of words became irrelevant, for what he lacked in words, he communicated in mite. Yet, in their lack of experiential comprehension, the guys welcomed him in – with fullness of friendship and bravery of spirit. Likewise, we encircled him with care at our Easter gathering. What we did not know, God knew. What we could not say, God said. Our eyes rushed heaven’s waters onto this man’s dry riverbed. Our hope, our simple, plain clothes hope, dressed this man in the promise of a Father who would always welcome him in – a Father whose kids would gladly go outside the camp for his sake. Sometimes you go outside one camp and into another to pull someone back out and into the camp of God – the tabernacle of His Presence. The temple built with cedars, no longer of wood, but of legs and arms and heads and hope. The temple built of us.